I’m finally making some progress on the sailboat. The weather had been too cold over the past couple of weeks for me to want to work on the boat – but the goal is to get the boat in the water by the boys’ spring break in mid-April, so I needed to get some work done. Saturday morning Will and I went to Defender Marine Outfitters for their annual warehouse sale. It was completely packed, but Will did very well walking around with me (and waiting line a little longer than we wanted when all the credit card processing went down (luckily I had a check book, so we were able to check out while the line kept getting longer and longer). We picked up some of the supplies we needed for the season. Will go a wetsuit for himself, and I picked up flares, a small inflatable boat, a new masthead light, and a first aid kit. Sunday I decided to move the boat from where it had been sitting between the house and the garage. The boat got almost no sun on it all day and stayed cold. I moved it to a place near the workshop. Closer to the tools and (hopefully) a bit warmer in the sun. I also took time to start getting the mast untangled from all of the rigging. The mast spent the past couple of years sitting behind the barn. 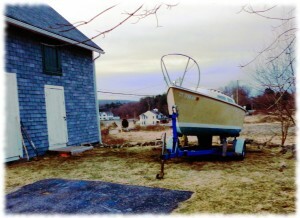 Last year, Susanna, the boys, and I pulled the mast off and cleaned it up. But I never spent the time to inspect and organize the rigging. At Defender, I purchased a Davis Mega-Light masthead light. I had to enlarge the hole on the front of the mast head (it looked like it had, in a previous live, been used as an VHF antenna). 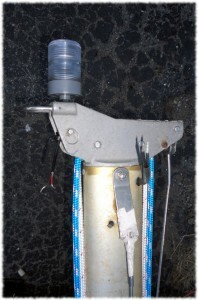 The masthead light required a 1/2″ hole. The leads to the light need to be soldered to the wires that are running up (inside) the mast. Unfortunately, I couldn’t find any solder (though I did find the soldering iron) – so the final connection will have to wait until another day. I also removed the stainless plate that was attached to the back part of the mast. I’m not sure what it was used for previously (I think there was an old, cheap, masthead light). I will probably attach a topping lift to the plate. Or just leave it off. I ordered some additional stainless fasteners. I needed #8 x 1″ screws to reattach the teak toe rails. I also needed some more machine screws to reattach the deck hardware. I have had good luck with BoltDepot.com. I also placed an order for the needed trailer winch (the old one was lost years ago) and trailer lights. Hopefully I’ll have all the parts needed to put the boat in the water. Now I just need to spend a day or two attaching the deck hardware. Over the past couple of evenings I have been looking at a new hosting company for hosting this blog (as well as a few other websites). I decided to move to a Digital Ocean SSD server. The beauty is that you can resize the server as needed to support more hosting (or reduce it if the larger plan isn’t needed). This blog runs WordPress. Previously I had run a CentOS server with an Apache web server. I decided to switch to Nginx from Apache based on some reports of better performance on Nginx. 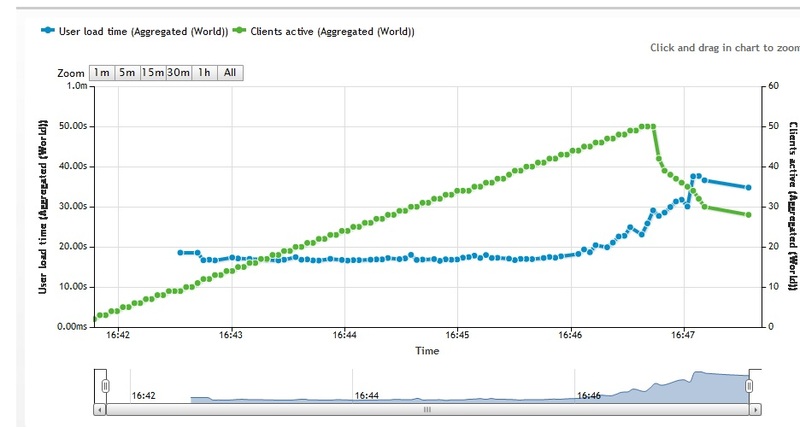 I ran a load test on the site before migrating to the new server and one after moving to a new server. the Nginx server handles a higher load without slowing down. Not that this site ever gets that much traffic, but it may allow for a smaller (cheaper) server to handle the website. The website load test before moving. The green is the load, and the blue is the response time. 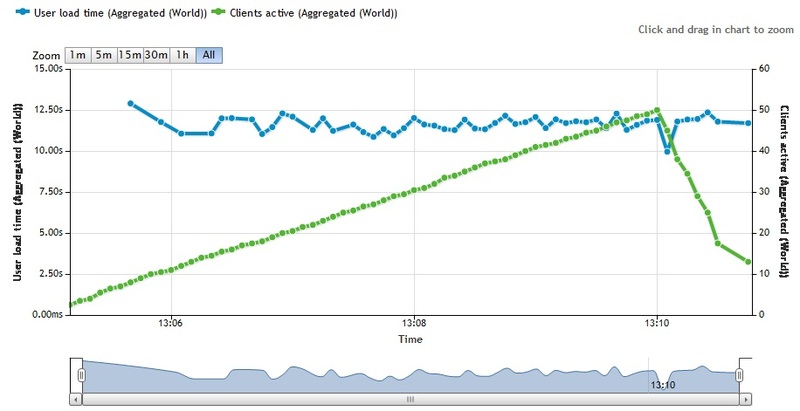 Note that the response time on the post-migration server stays flat for the entire load. The time scale on the left is different from the scale in the first graph. So far the migration was reasonably straight forward. I need to work on the Nginx script to allow better permalinks for WordPress. That will be my project one of these evenings. Will helping show off the new dog pen gate. The boys are here today – we were able to enjoy a full week together this week – so it wasn’t a day I could totally dedicate to home projects. But it was a quiet day for the boys, and they spent most of the day playing together, or hanging out helping work on projects. During the colder months of the year, the dogs spend the days on the three season porch off of the kitchen. However, it gets too hot in the summer for them, so I fenced off the last bay of the garage to make a dog pen. I had taken down the fencing that had blocked the main door earlier in the year so we could paint the trim. I had always hated having the doorway entirely fenced off, and the quick fencing job I had done earlier looked terrible. There is a side door to get into the bay, but a full gate would allow easier access to the space. This morning while at Home Depot, the boys and I picked up hinges and a latch to build a gate. After lunch I spent some time working on building a gate to the bay. I milled some of the rough lumber that I had picked up a couple of weeks ago. I initially pulled out some oak to build the gate, but decided to go with soft maple (the maple is lighter). Neither are good outside woods, but the gate will eventually be painted. The gate isn’t completely finished. I think I need to add a diagonal cross brace to keep the gate from sagging (though I don’t expect to use the gate too frequently, so I may hold off on adding that). I will also add a bottom latch/lock so the dogs can’t push their way out from the bottom corner. I also need to put some bricks/stones under the gate so Tucker won’t dig his way out. The gate was on my original (proposed) list of projects to finish on a furlough day. It is nice to move projects off the to do list. And yes, I was finally able to get some quiet time in the evening before dinner to sit by the fire pit and enjoy a beer. 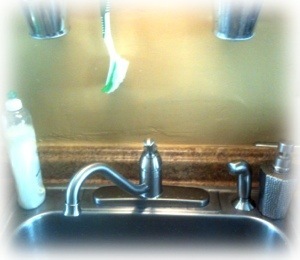 I finally got fed up with the dripping faucet in the kitchen. So, this morning the boys and I headed to Home Depot and picked up a replacement. The project took less than 2 hours including the trip to the store. I’m tired tonight. More than just tired. I’ll probably head to bed when the kids go to bed. We started this morning at 5:30 when Will and his friend, Shane, woke up. Sleep overs are fun, except at 5:30 in the morning. Will and Ben had a great morning spent mostly fighting with each other – got to love brothers. At least by the afternoon they were finally playing nicely together. I’m sure it didn’t help that everyone was up early and didn’t get enough sleep. But that is okay, they will go to bed early tonight, and hopefully sleep in. I told them tomorrow is house cleaning morning, unless they sleep in too late to clean the house – I’ll see if that works. If not, at least we will have a clean house early in the morning. 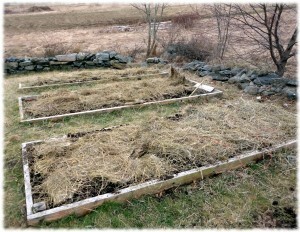 I took the boys over to Rob and Anna Sawyer’s farm to pick up fresh eggs and a trailer load of horse manure compost. 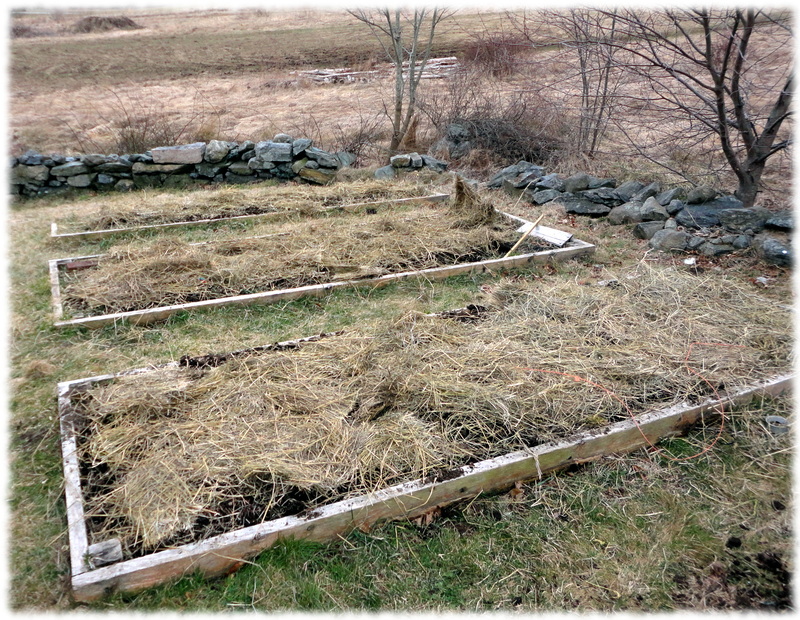 I spent the afternoon spreading compost and getting the garden ready for the spring. It wasn’t as warm out today as I had hoped, but it wasn’t too cold to get some yard work done. I could at least get some chores done while watching the boys run around the yard and the woods behind the house. I didn’t get any time in the shop, except to build swords for the boys. But that is okay, maybe I’ll get in the workshop tomorrow. Tomorrow should be a nice quiet day – no friends over. Will’s room, refinished, redecorated and reorganized. Well, nothing in an old house is ever completely finished. However, we made our goal for the weekend. I wasn’t always sure if we would make it. Today I finished touching up the wall and trim paint as well as finished painting the door. I fixed the radiator where it was leaking (note to self, make sure the joint is clear of any foreign material before mating up the radiator to the valve). I also hung the curtains around the closet and on the windows. I don’t mind doing the wall repair and most of the painting, but I am very glad that Susanna is a good organizer and decorator. 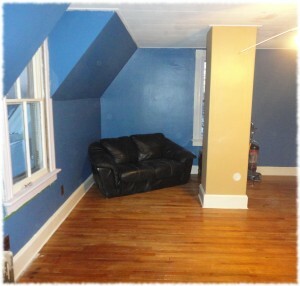 It is the little things, like having the couch at an angle vice flat on the wall, that makes the room really stand out. She also does a great job sorting through the toys and getting rid of things no longer needed. Of course, you can see her organization skills in the rest of the house. As far as room colors, we worked together on the paint scheme, and I think it came out very nice. I am certain life would be more chaotic and disorganized without her help – but it isn’t just organizing things, it is finding a way to organize that also fits each room that makes a big difference. Now if could only get her to help with the workshop. And to top it off, organizing and redecorating is something that she loves to do (with the exception of the workshop of course…). Will’s room is tricky. There is a chimney in the middle of the room. The chimney will be taken out one of these days, but for now it is there. It also has a large closet on one wall that used to have sliding doors. I removed the doors, but that leaves a long unusual space to deal with. We repainted the open closet – it has a lot of colors – blue for the walls, off white trim, gold for the walls and brown on the floor that was previously painted the trim color. 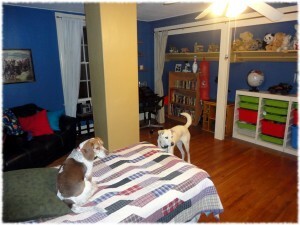 One of the biggest challenges with the room is fitting in his bed and the love seat. With the chimney and the large closet space, his bed really only fits in one of two places (the corner where the couch is or where we wound up putting it). I have tried several arrangements of the room, but I think this one finally got it right. 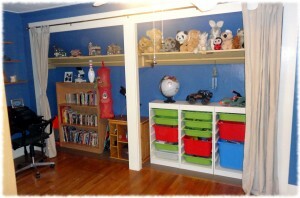 The closet space opened up and reused for storage. We repainted the open closet – it has a lot of colors – blue for the walls, off white trim, gold for the walls and brown on the floor that was previously painted the trim color. We were able to reuse paint from other projects. The gold accent color is the paint we used for the top of the walls in the kitchen, and the brown on the closet floor is the same floor paint we used in the hallway/back stairs. 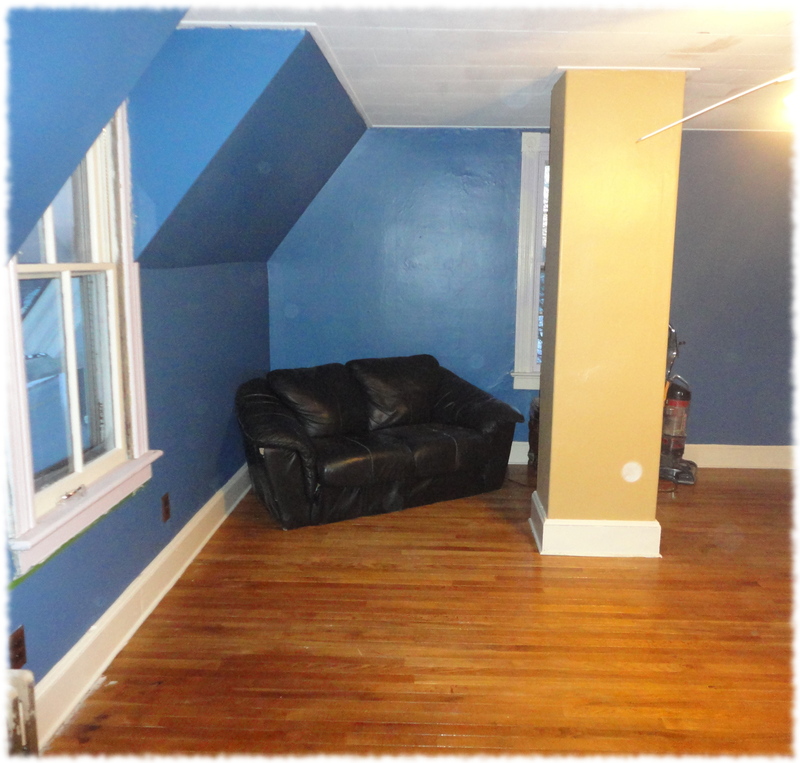 The trim paint is the same trim paint that we use in most of the rest of the house. Even though all of Will’s belongings are out of the guest room and back in his room, I still have some odds and ends to wrap up in his room. I have to hook up the wiring for the new outlets in his room, but that only requires work in the attic, the guest room and basement (I didn’t want to yank power to the guest room while Will was living in it). I also need to reinstall the inside stops on the window next to his bed. That is a quick afternoon project, and doesn’t impact the room very much. I will hang the door tomorrow (I don’t feel like going to the workshop tonight to get the parts needed to put his door back on). And, finally, I need to finish painting the window on the far wall – I will probably wait until it is warmer and take out the upper and lower sashes and paint them outside. I haven’t gotten the official notification yet, but it is coming soon. It looks like I will be furloughed one day a week starting in late-April. It will last up to 22 weeks (22 unpaid days off). It is a big cut in pay for six months – which adds stress. But on the good side, it is during the summer, and if I’m going to get extra time off, I would rather it be in the summer. I’m working on a plan. I’m thinking that I should take the opportunity to get things done around the house. I had initially thought about making a list of 22 projects that I could do in one day (and that don’t cost much money). I think 22 projects would be too many. On the summer days that the boys are here, I want to be able to spend time with them, and not be a slave to house projects. Also, I would like to spend time with Susanna’s family when they come for the wedding. I could also just spend the time working on whatever house project is in progress. But I’m thinking that it is a good chance to do some smaller projects that might otherwise be put off until a later year. I’m leaning towards making a list of 11 projects to finish on furlough days. I’m also discussing doing group projects with some of my co-workers if they are furloughed on the same day – that may allow bigger projects at each person’s house, taking turns at each house. So here is my list so far (in no particular order). I’ll sit down over the next couple of weeks and prioritize them with Susanna. There are more than 11 projects below, so I’ll have to pick the ones I want, or maybe just have a long list and see if I can get 11 of the projects finished. Add two electrical outlets to the study. Will’s room is making progress. We are (almost) on track to move him back into his room on Sunday. Susanna has a couple of ideas about rearranging and decorating the room, so hopefully there will be a nice surprise for Will when he comes home on Monday. The kitchen island is making progress. I roughed out the planks for the top. Now I have to mill them to size and glue up the top. I plan on gluing the top in two parts and then gluing the two parts together. After that, all I have to do is spray finish the bottom (a one or two night project). I’ll post pictures of the projects later. Time for me to head into work.